As graphic designers, there are too many design elements you can use which are immediately available on the Internet. Although you will always prefer to create your own illustrations and artworks for your designs, it is inevitable to reach out for further resources for so many reasons. Whether it’s because of time constraints or limitations in skills, you will need outside help from time to time. Luckily, there are thousands of design items of various types that are ready for use from different places of the World Wide Web. Logos, icons, banners, labels, illustrations, and more; you will always find something perfect to use whatever you need. Just like this list of gorgeous graphic design ideas and illustrations created especially for Labor Day. You can use these items to boost your design projects for this upcoming holiday. Let us start with this simple but classy Labor Day label illustration thanks to its shabby texture, vintage fonts, and retro style. 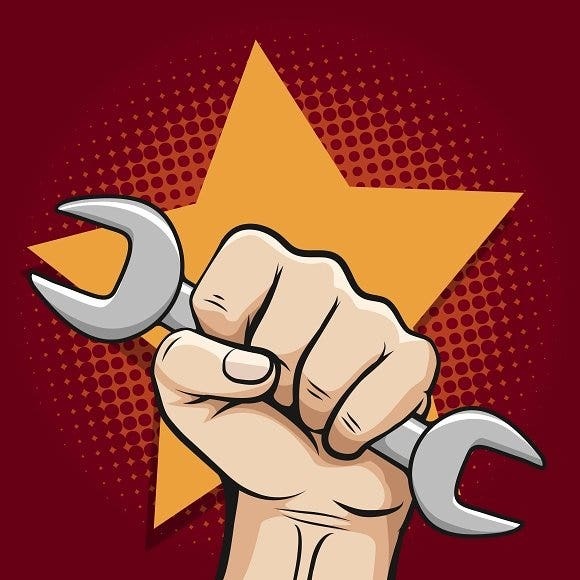 Just like many other design concepts for this specific occasion, this template features a hand with a wrench which perfectly represents the American workers. With both vector EPS and layered PSD files included in the package, this item is fully editable so you can modify its content with your own specific details. 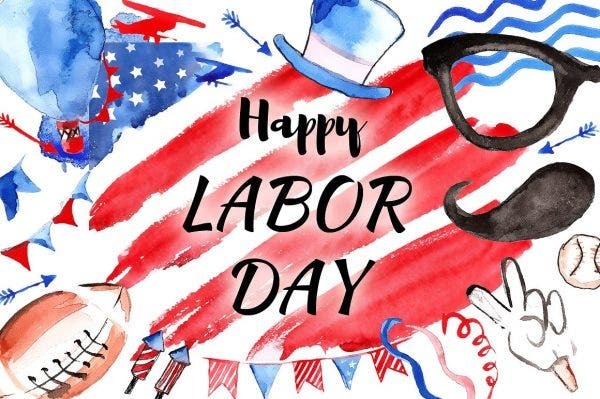 Next is this Labor Day text illustration that is perfect to use on any design project, whether you’re making greeting cards, invitations, party flyers, and so much more for this special holiday. Featuring cute cartoon illustrations of different construction tools which form the letters to spell out the name of the occasion, it is hard for your audience to miss this eye-catching design. Available in different resolutions, you can use this item in both web design and print. If you’re looking for a perfect artwork for your t-shirt design and other apparel items, look no further and get this gorgeous t-shirt illustration. Featuring a worker image over an American flag background, it is a great way to wear and flaunt your American worker pride during your Labor Day weekend parties. The design comes in an Ai and EPS organized layers, so it is easy to customize the text and color to suit your taste. 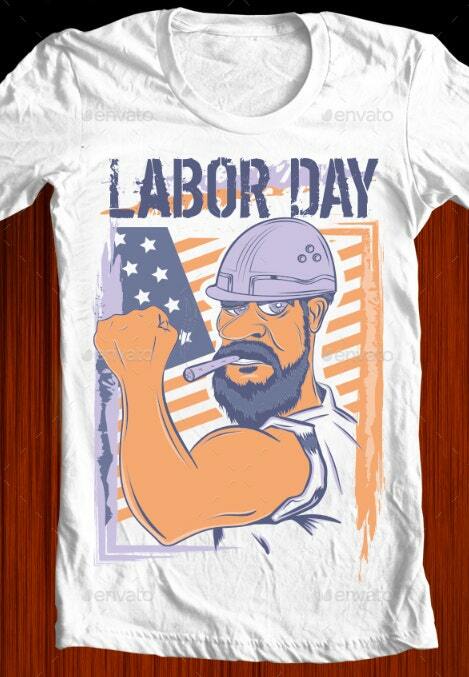 Then, we have this not so common design idea for Labor Day that you can also use for various design projects. With two crossed hammers and a greeting text over a ribbon banner, it deviates form the usual tool-in-hand illustrations. It comes in a zipped file with editable EPS10 vector file format and high-quality JPG file. Modify the text and add more elements easily to make into a poster, flyer, greeting card, party invitation, and more. Pow-wow! 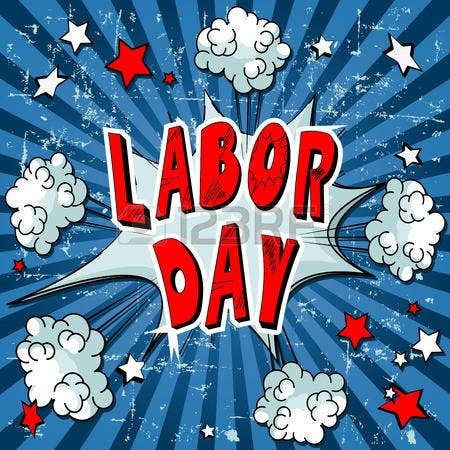 Here is a fun and exciting comic book illustration that you can use for your Labor Day design ideas. Using the infamous American color palette of white, blue, and red as well as some grunge effects, this item presents a 60’s-inspired comic book concept which expresses an explosive party atmosphere. Use it as a cover for greeting cards, a poster background, or a text element for other design platforms. 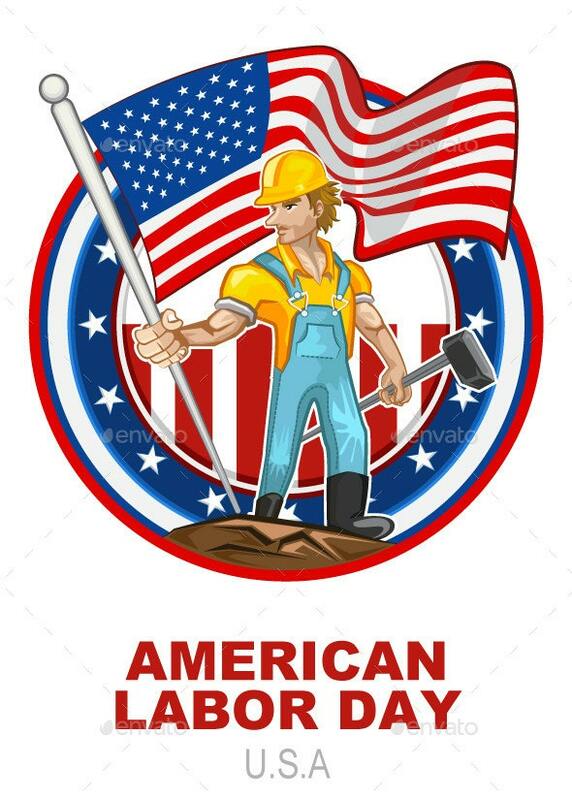 A classic cartoon illustration and beautiful representation of the American Labor Day includes an image of a hardworking American worker holding a hammer and the American flag. This is what is shown in the illustration template above. Available in different formats such as Vector Ai, EPS8, and high-resolution JPG, this template is easy to use and customize. Decorate your flyers and cards with this fantastic illustration design. 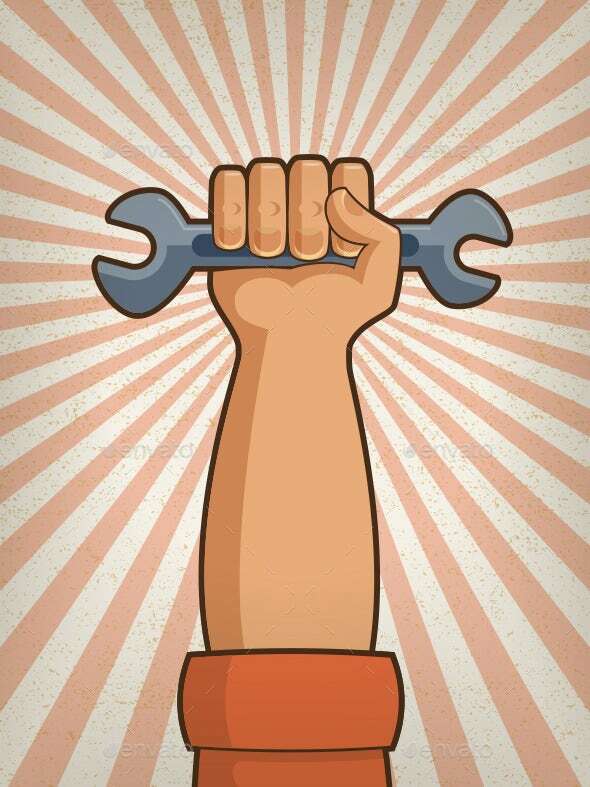 Use the traditional design idea of a raised hand holding a wrench but with a vintage twist to present Labor Day celebrations through this working hand illustration. Artsy and classical, it is perfect to use on all of your design projects. As a vector illustration, it is easy to use as it allows you to tweak and modify its color and other elements, so it matches your design concept. A personal favorite, make sure not to miss out on this one. 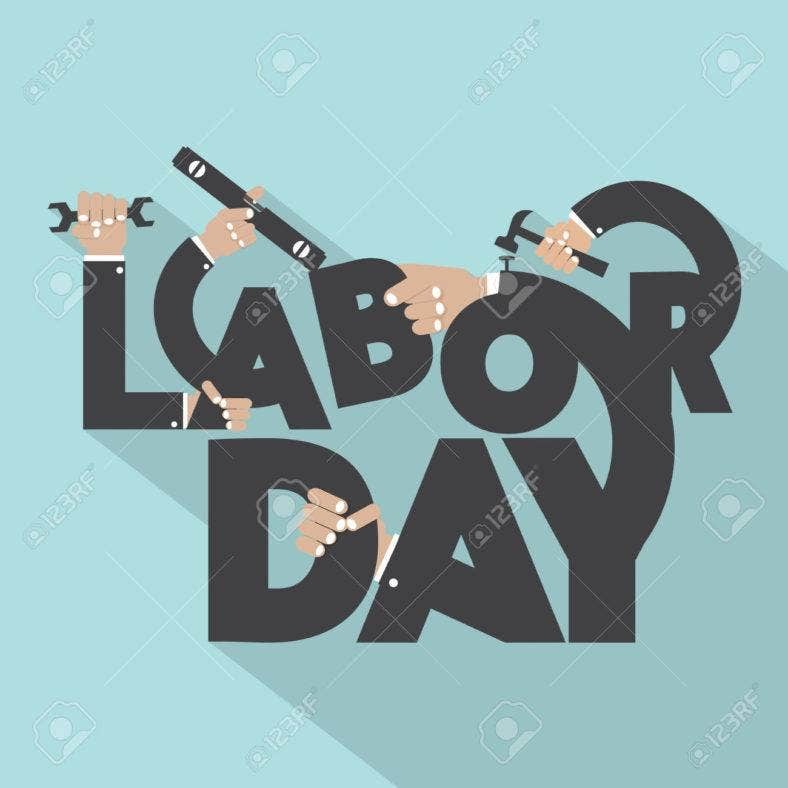 Another way to design a Labor Day concept is by using typography vectors like the illustration you see above. Showing a number of arms holding together to form the words, it perfectly epitomizes the unity and solidarity of the American workers towards each other and even towards the government. With a deep symbolism to boot, you can use this illustration wherever you need a metaphorical idea for your design. This is another type of illustrative design concept that uses the typical wrench-in-hand idea, but this time, it uses an elegant retro theme with a neutral and pastel color scheme to exude a rather calm and dainty aesthetic. It comes in various file formats, namely Ai, EPS, and JPG, with a good file structure as all layers are named and all objects are logically formed into groups. Thus, making it easy to change colors and move objects around. Next is a set of stunning clip art and beautiful watercolor illustrations using watercolor paintings and cute hand-drawn elements. With scanned artworks at high resolution and with a transparent background, this bunch of design templates allows you to create awesome and unique design items such as logos, cards, poster, flyer, invitations, banners, and etc. Included in the package are 40 separate elements in PNG that you can combine and use together. 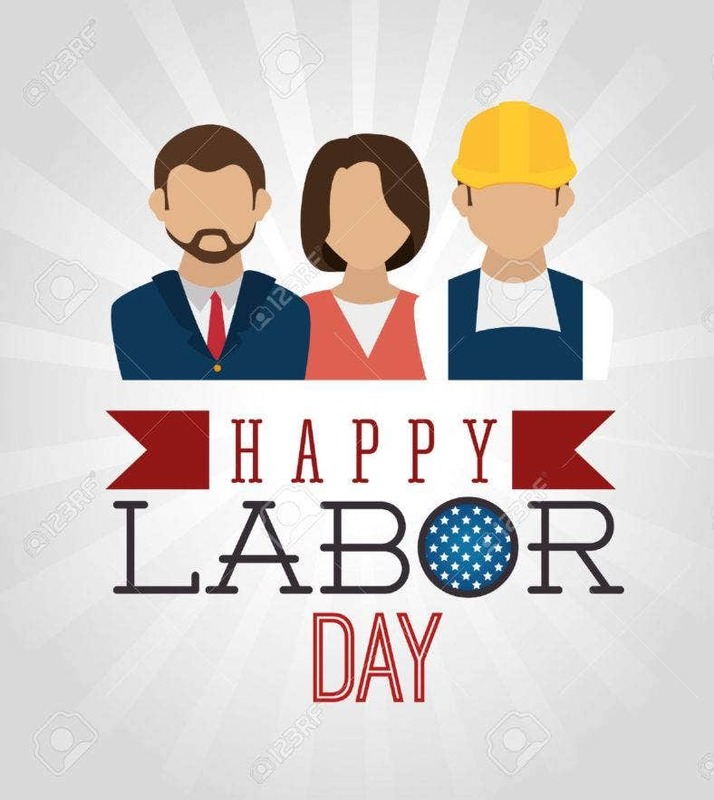 For your Labor Day cards and other design projects, here is another flat design illustration featuring images of various workers, an all-American color scheme, and a Labor day greeting over a clean white background. This minimal vector illustration is perfect to use if you’re looking for a clean and simple design material for your projects. Easy to use and easy to customize, this item works well with minimum design experience. 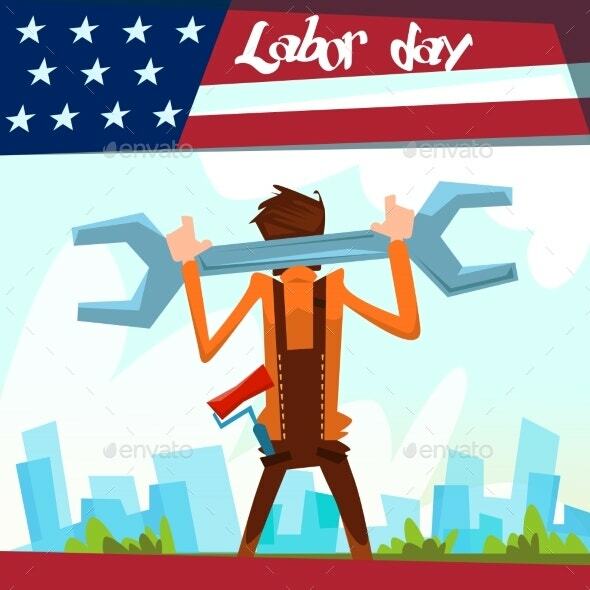 Aside from the usual Labor Day design elements like the American flag and corresponding holiday greetings, here is an illustration that features an image of a worker with a big spanner builder facing an industrial city which totally describes how the American workers built the country. This graphic design illustration is created with a flat design, so it is not difficult to incorporate this item into your many design ideas and working projects. 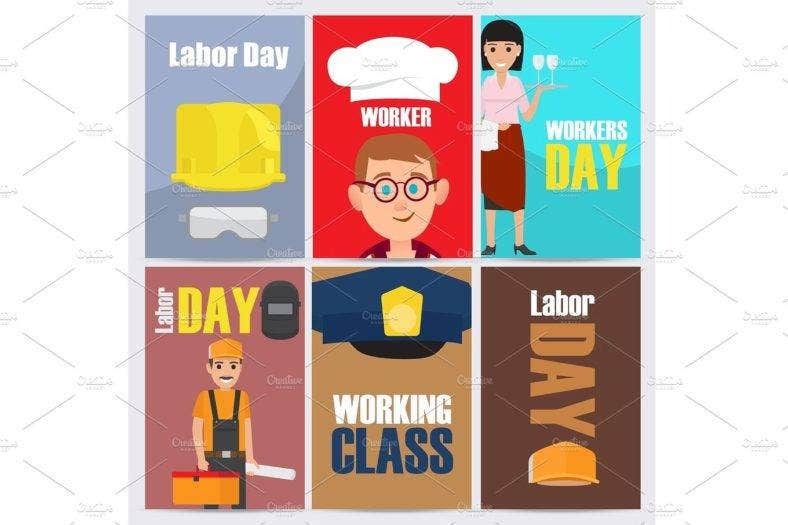 Here is a Labor Day-themed illustration set which features elements and images that you can use for posters, flyers, invitations, greeting cards, and others. It features vector illustrations that depict a child who dreams of being a chef, an enthusiastic waitress holding a tray of glasses, and a construction worker with a tool box in hand, which are all perfect representations of a true American worker. Use these items and enhance your design ideas. Rustic and gritty, yet beautiful in its own way. 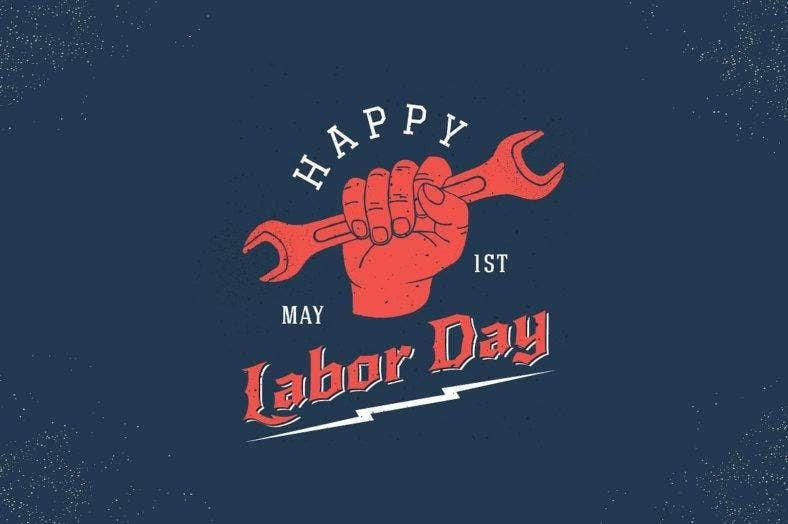 This vintage vector illustration comes with grungy effects that is great to use as backgrounds for party flyers and event posters that are given and posted to encourage party-goers or invite friends and family members in celebrating the American Labor Day. Available in many sizes, this vector item is perfect for both web and print use and as well as for social media use. 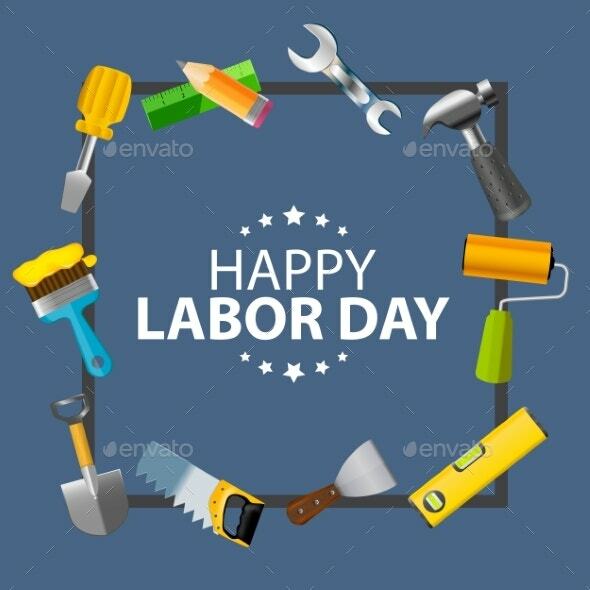 Another flat-designed Happy Labor Day poster illustration, this vector template comes in JPG image and vector EPS formats which are simple to use and easy to customize according to your preference and needs. 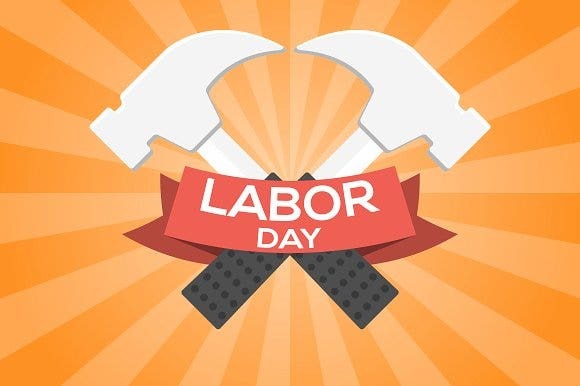 It features a straightforward holiday concept that uses various tools used by different types of workers which form a visual border to a simple holiday greeting. You can use it as greeting card covers, an event poster or flyer background, etc. 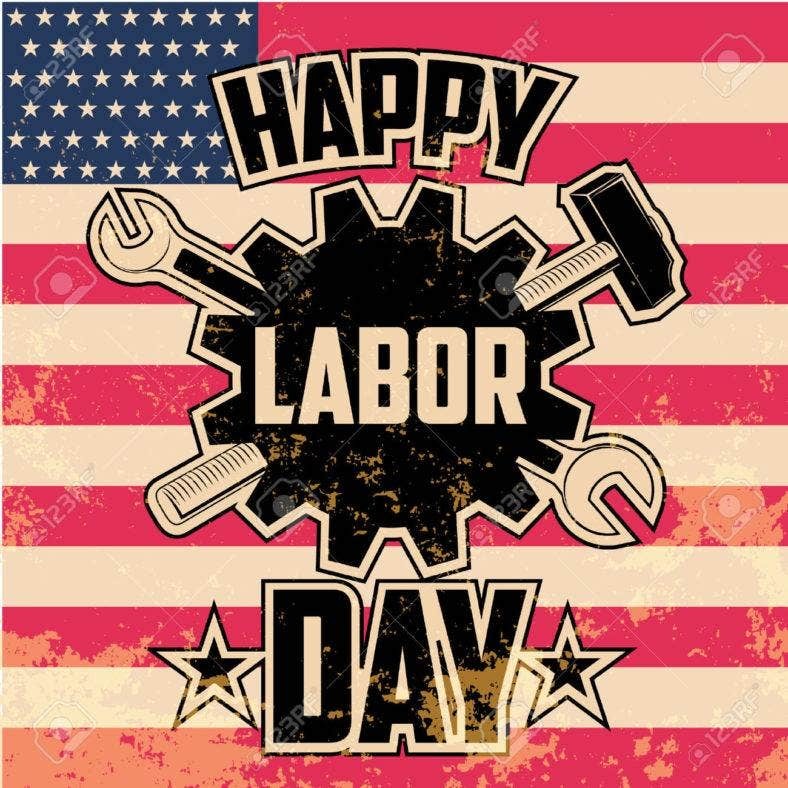 Labor Day is not only for the office and field workers. Mothers, especially, are some of the important people that we should dedicate this special occasion to. 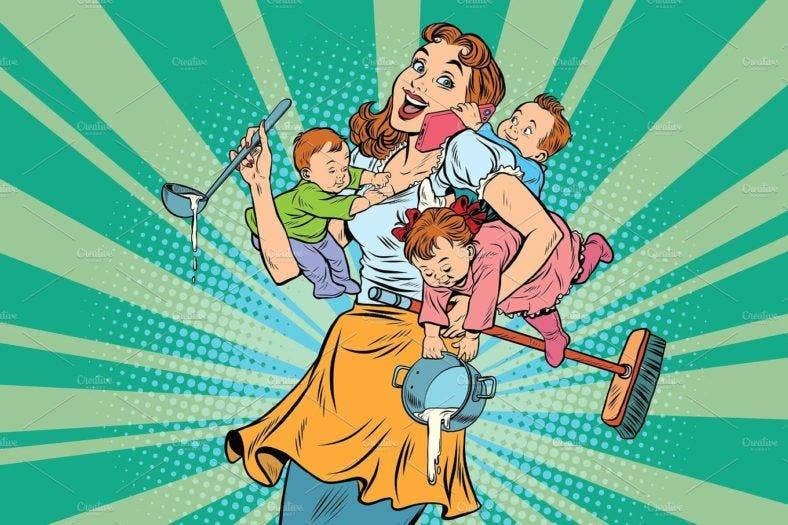 Just like the cool pop art illustration you see above, they toil away taking care of the family and making sure we have a comfortable place to go home to every single day. So, it is just right to include and end this list with this inspiring and touching present to all mothers out there this coming holiday. As you have reached the end of this article, we hope that you were able to find what you are looking and get inspired by the illustrations presented here. As mentioned for each item, these illustrations can be used for many design projects. Whether you’re building a marketing strategy for your business or exploring new and innovative ideas for your Labor Day celebrations, there is always a great item for you to use in this list. Put your designs to work and make this special day a little bit more extra by using a number of unique design ideas from this page.